The last weekend in November is a full weekend of music at the Nirox Sculpture Park in the Cradle of Humankind. There’s the Celebration of Bob Dylan on 25 November, and Sunday 26 November is the Love Paws Concert, featuring a trio of South Africa’s favourite musicians raising funds and awareness for mankind’s feline and canine friends through the NGO’s 4Paws and PawsRUs. 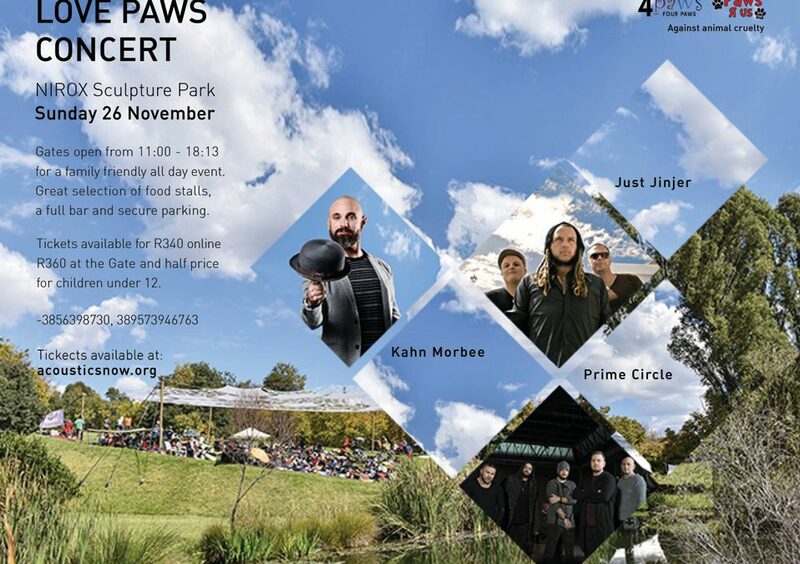 Prime Circle, Just Jinjer and Kahn Morbee will be performing a live, acoustic showcase in the Nirox amphitheatre in the Cradle of Humankind – a World Heritage Site. Guests can enjoy a wide selection of excellent cuisine from the Epicurean Emporium, the fully-stocked ‘Bernie’s Bar’ and classic South African music, all the while contributing to the terrific work being done by 4Paws and PawsRUs. Tickets are available online – R340 per person online. R360 at the gate – subject to availability. Children under 12 pay half-price. Infants 2 and under enter free of charge. No food/drinks/pets through the gate. Audience numbers limited, so pre-booking strongly advised. If you’re looking for somewhere to stay over that weekend, Dalens Luxury Apartments and Self-Catering Accommodation is the perfect venue being only 15 minutes away in the Cradle of Humankind and 4 minutes from Lanseria Airport. NIROX comprises an artists’ residency; studios and workshops; a sculpture park; outdoor concert venues; and related function facilities. It is located on15 hectares of landscaped gardens and waterways within an extensive private nature reserve in the heart of the Cradle of Humankind World Heritage Site, 45 minutes from the centers of Johannesburg and Tswane. NIROX is committed to excellence in all disciplines of contemporary arts.